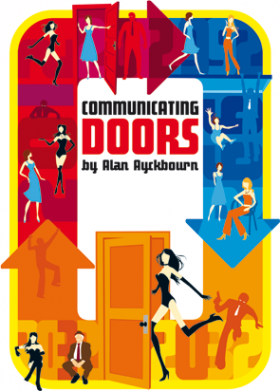 This was meant to be The 39 Steps – however due to the indisposition of one of the actors due to an eye injury ( I’d like to imagine the understudy punched him to get the lead role) this was, at the last minute, switched to Alan Ayckbourn’s time travelling comedy drama Communicating Doors. Three women. One hotel suite. In 1992, one is on her honeymoon night. In 2012, one is about to be murdered. In 2032, one discovers that a communicating door holds the key to all their destinies . . . When Poopay, a self-styled ‘Specialist Sexual Consultant’, is summoned to a five star hotel, it transpires that her elderly client isn’t interested in her usual services. Instead, the conscience-stricken Reece wants her to witness his dying confession: that many years before, he employed his business associate, Julian, to murder his two wives. When he learns of the confession, the deranged Julian decides that Poopay must be silenced permanently. Terrified, Poopay flees through the communicating door, only to find that it leads not into an adjacent room, but back into the same suite . . . twenty years before on the very night that wife number two is about to die. This reviewer has a chequered history with Ayckbourn’s plays. His output is often very much of its time and revivals of his work often seem badly dated. After an over-long set up this however turned into an absorbing evening’s entertainment with deft acting and storytelling keeping the story arc cohesive and engaging. On the down side, one point of weakness is the staging: the setting here is 1992 and the 2012 of the play is the future. Possibly due to a slightly outdated set decoration (the actual design which incorporated the time-travelling door was cleverly done) but without significant decorative differences across the years this wasn’t conveyed as well as it could have been. For Pitlochry this is a surprise as it’s usually known for phenomenally inventive set design. This Ayckbourn play has fared better than most and provides as many laughs as suspenseful moments. Worth a visit.